Well done, Molly! And happy up-coming birthday. Love the colors you chose here. So cute. Love it when something comes together for mommy and urchin fun. A girl as talented as her mother! Hee hee - what fun! Love his legs. Gorgeous Molly! You must be so proud of her Mummy! That's fab! Well done Molly! Watch it Lynn, the competition has arrived! My Guppy is only 2 and 9/12ths, and while she can do some fun & crafty things with me, I know that if I'm not paying attention I'll blink and she'll be makeing adorable creations like this one before I know it! Good Golly Miss Molly - what a great ducky! Gorgeous! Ducky made me smile this morning! Fantastic- what a lovely ray of sunshine! Uau! I'm very impressed. It's lovely. Could you ask her if I can use her idea? I think my daughter will love it. It's grey and freezing in NYC today - and this was just the ray of sunshine I needed. I'll be smiling about this until bedtime! Hurrah for Softies! Hurrah for Molly! heehee, to cute. 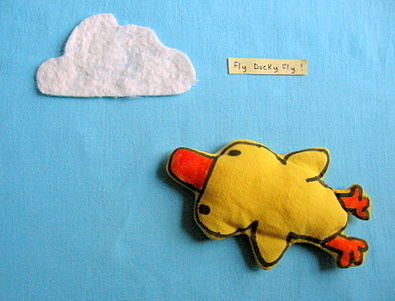 Flying Quackers! Molly's a girl after my own heart! aww...I love it. You could make a whole town/play area if you wanted to! The colours are beautifully fresh and remind me that spring is not so far away now. I'd just like to say for the record that I adore your blog and all the amazing crafty things on it. Including this one! You always have something interesting to say or a pic of something lovely to post. Thank-you. SO cute!!! I love your blog! Thanks for making me chuckle and filling me with awe for your creativity! Molly will have these memories forever, that is awesome! Too cute! Can't wait for my little one to be old enough to do crafts! How cute!! Makes me smile. A quick delurk because this is so cute. Can't wait until my one-year-old is able to create a little art like this! And I hope to make an advent calendar inspired by one I saw on your blog some time ago. How cute! And apparently she has a birthday fast approaching so a happy early birthday to her. I really like the duck. Well done !